Looking for love online has become a digital craze, and it is a cut above to use Short Messaging Services and dating apps for iOS and Android. People spend more time on high quality dating website than on Facebook or YouTube. Somehow, there is a big community of people out there always looking for love, and for you, it means a great deal of business opportunity. 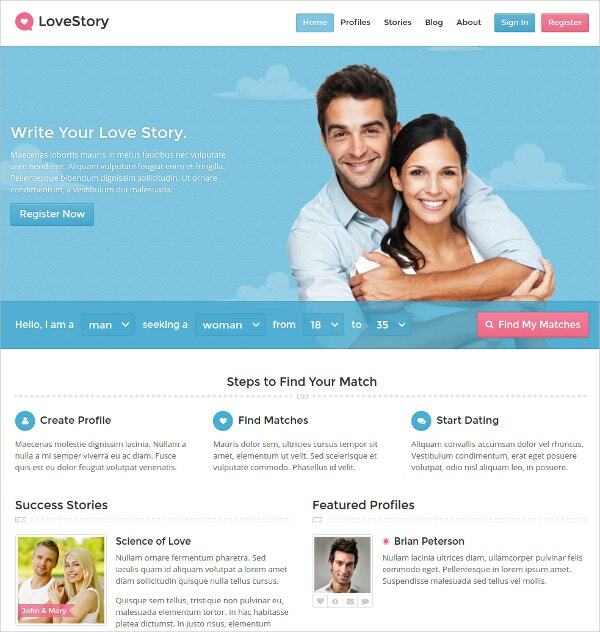 You can use the following Dating Website Templates to start a dating service and help people find love online. If you are looking for a template that runs on PHP 5, implements JQuery, and features a beautiful layout, this may be the right theme for you. Whether you want to update your current theme or you want to set up a new website from scratch, this is definitely the best theme to buy and implement. If a combination of the best colors, fonts, and images is anything to go by, this theme definitely takes the cake. The navigation is in the right place, the landing page is as cool as you’d want it to be, and the images are replaceable. The WordPress theme is easy to customize and the developer provides a useful documentation. 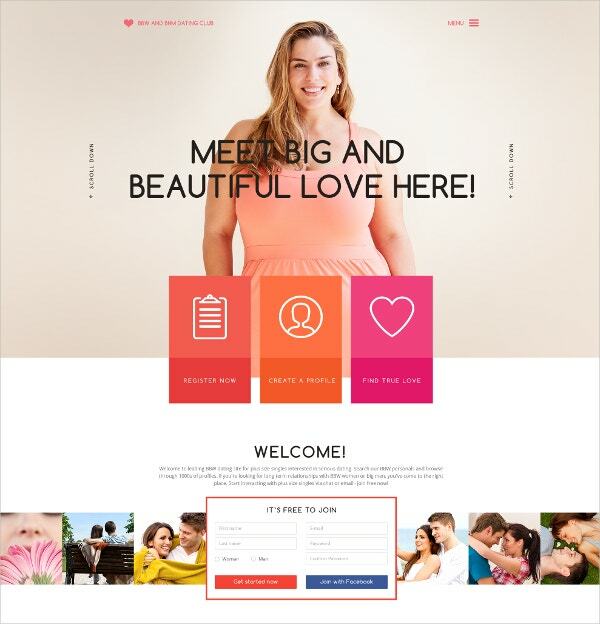 Built in PHP 5, JQuery, CSS3 and HTML, the professional WordPress theme is suitable for dating agencies as well as individual dating website business owners. 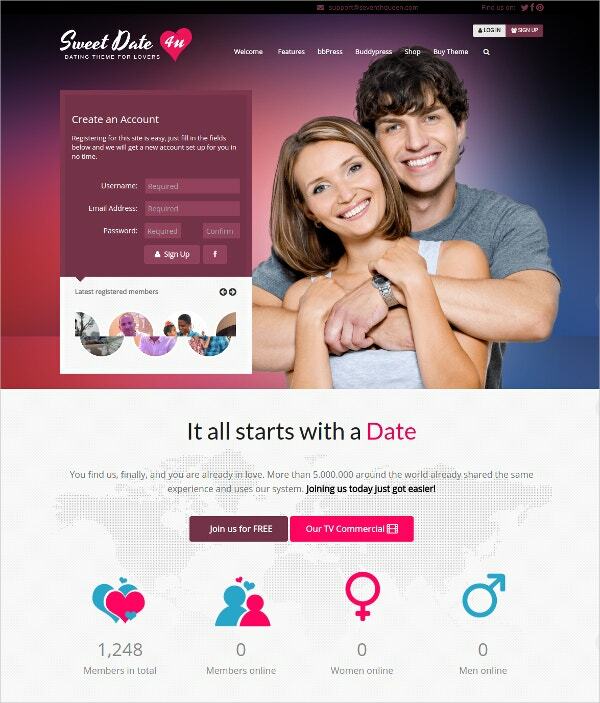 The theme is easy to install and customize, and it has what you need to start and run a dating website. High quality fonts have been used for the theme. 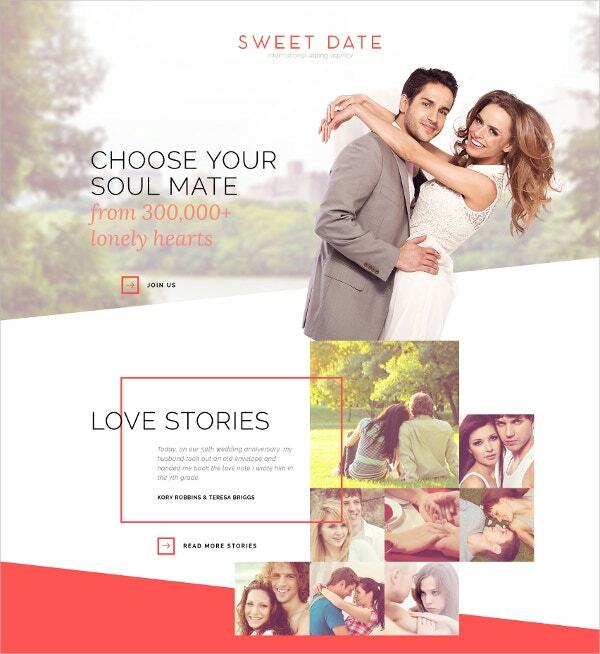 A theme that emulates Facebook’s layout is a high quality and good enough for your next dating website project. You can get the full template for only $59. 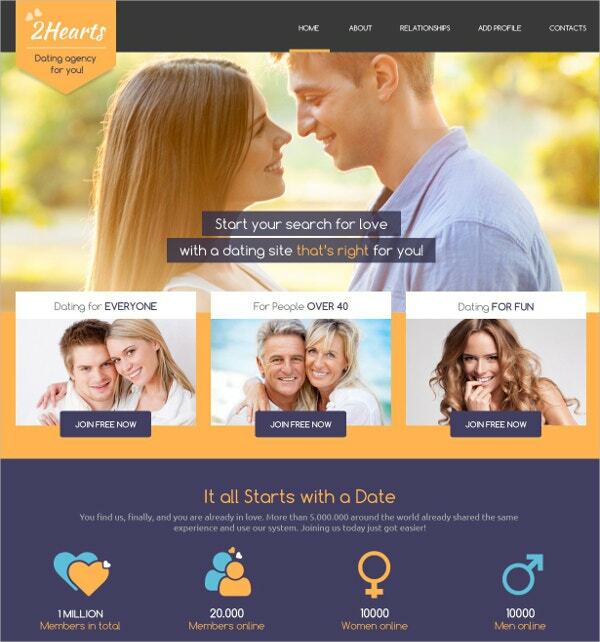 The theme is responsive, cross-browser compatible, and is the best theme for those who prefer a dating website theme that comes with a timeline. The dating bootstrap template is a 100% responsive dating theme that works on all latest browsers including internet Explorer 10 and later versions. It features the latest version of JQuery, the PHP, CSS3, and HTML. It is the best if you are looking for an application that works on mobile as well as desktop computers. The template is cheap; you would think the developer is giving it at a throwaway price after committing to many hours of hard work. 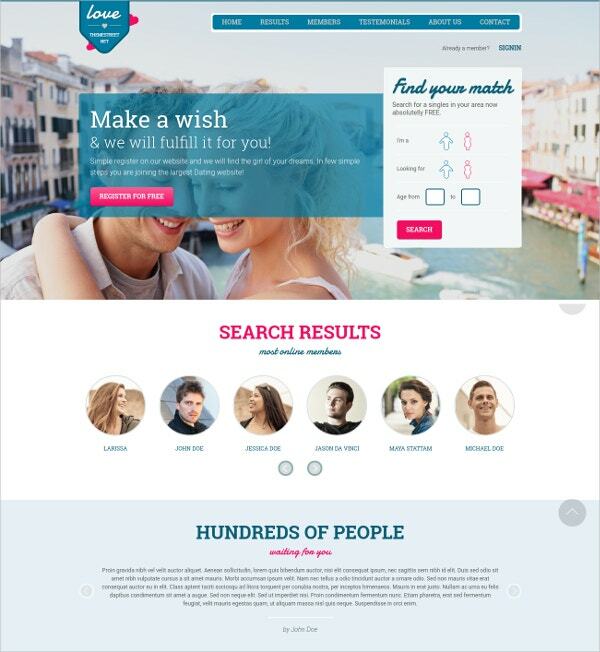 It is incredibly dynamic, highly responsive, visually appealing and attractive, exactly what you need to create the best dating website on the fly. The HTML Website Template doesn’t leave much room for too much coding, which means you can focus more on optimizing the website and the development aspects of it, and then go straight to welcoming people to visit the site as often as they can. 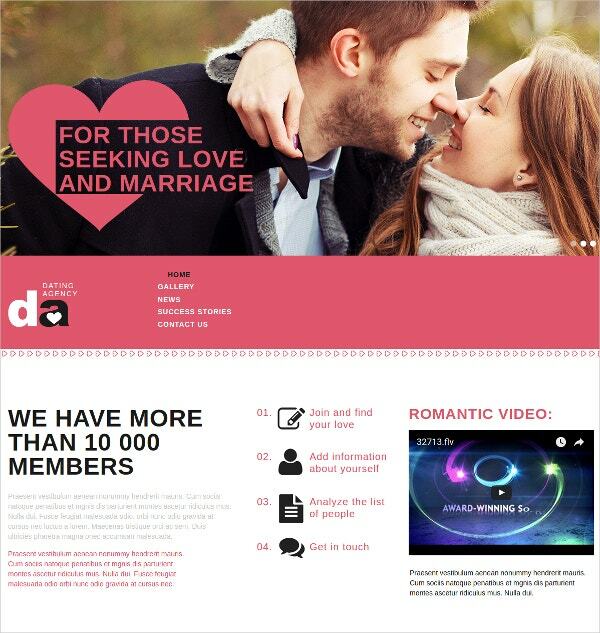 Before you start an online dating service, you need to think about how your website will look. Attraction is necessary, so picking the right template can save you a lot of design and implementation time. 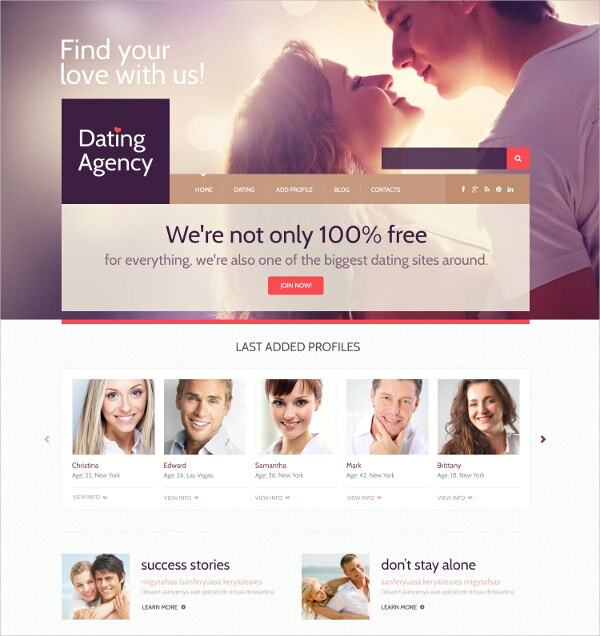 You can buy this premium dating website template and use it exactly as it is without bothering to change anything. 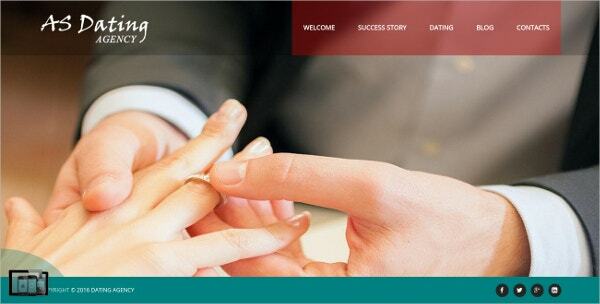 You can also see Dating Joomla Templates. Modern HTML Dating Website Template is a combination of well-thought layouts, latest fonts, and high-quality replaceable images. The layout features friendly navigation, readable text, and of course, friendly colors. Why go through the pain of creating this yourself when you can buy the template for $13 bucks? The features of this template include 100% responsiveness, cross-browser compatibility, ease of implementation, and ease of use. The target audience is those who would like to start dating website services; the website can earn you money via Google Ads or paid subscription. Although the sub-heading reads HTML website template, the $99 theme is not only cross-browser compatible but also responsive. 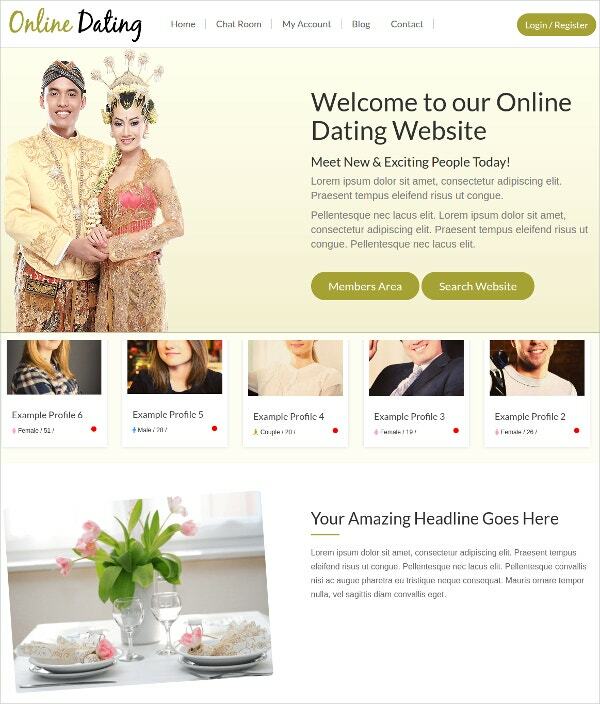 If you are developing a dating website for a client or looking for a template that will help you set up your online service in minutes, this is the best theme that you should use. You may also see Dating WordPress Templates. Designing a responsive CSS layout is absolutely time-consuming. A free CSS dating website template will save you a lot of time and enable you to set up your website in a couple of minutes. Because the template is responsive and cross-browser compatible, you don’t have to worry about what device it will run on. Starting a dating agency can create an opportunity for many singles around the world to connect with each other, and it doesn’t take centuries to set up the platform. 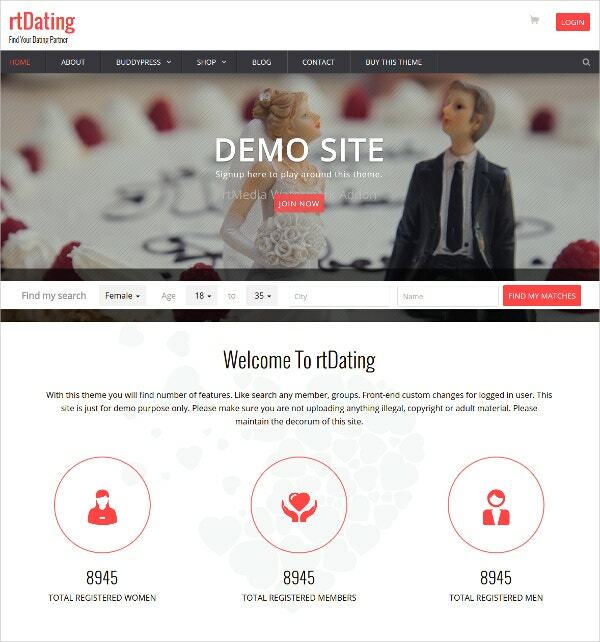 The HTML dating theme, a forty-one bucks responsive template, is the theme you need to set up a friendly dating website. The theme works on both desktop and mobile browsers. Dating websites are gaining popularity in the market today with exceedingly serious people searching for the best websites that provide the best dating features. 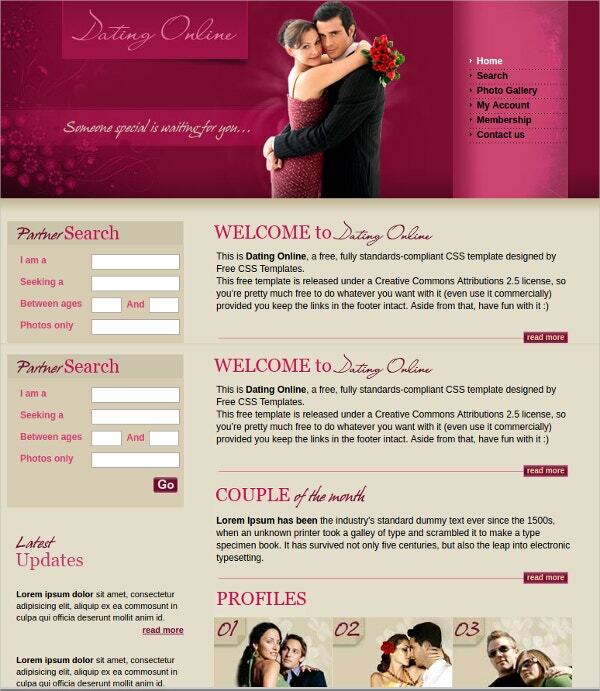 Take the step forward and create a website that people can rely on for online dating and matchmaking.